The Celebrity Cruises Visa Signature credit card currently has an Informr score of 6.5 out of 10. This score is based on our evaluation of 2 sources including reviews from users and the web's most trusted critics. Celebrity Cruises Visa Signature credit card is typically available to those with good credit scores (650 or greater). There are very few individuals who will find the offer of the Celebrity Credit Card worthwhile. Furthermore, the MyCruise Points you earn through this card can only be used to provide discounts on future cruises, or onboard credit – a reward with far less flexibility than most. 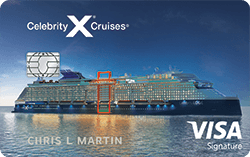 You’ll have to frequently cruise with Celebrity to reap the most rewards out of the Celebrity Cruises Visa Signature card. While the first year’s bonuses and discounts more than offset the $69 annual fee, finding enough value to keep the card for subsequent years may be a challenge. On qualifying purchases with Celebrity Cruises and our sister brands, Royal Caribbean and Azamara Club Cruises.